Capitalism Is Obsolete: One Thing You Can Be Certain Of? A certain, limited number of people, made a lot of money. As I have said many times before: getting rid of Capitalism won't rid us of all human frailty. We will still be just as susceptible as we are now to the lures of fear and selfishness as we have always been. What it will do, however, is get rid of the now equally hot, "hot house environment," that stimulates abnormally towards the mega fulfillment (that electrified production now mandates), of the most easily commoditized expressions of those two, main human weaknesses: as in addiction in every guise you can imagine, or the skid greasing magic of payoff, so's the few weak (especially in positions of oversight), who do happen to notice, keep it to themselves. In this particular context we must, at long last, recognize the futility of any further "wars on drugs." All this has served to do so far is make drug cartels richer; people who take bribes richer, and the manufacturers of the parifanaily of what one needs to wage drug wars, richer (which includes the prison systems for hire now, as well as all of the equipment, and extra staffing). And in all of that not lowering the rates of addiction much at all, if any. There is also the problem of how a cost based economy can't even prioritize critical issues anymore, let alone apply any consistent effort towards solving them. The few, who have the most, don't seem to value the same things as the rest of us any more. That's their prerogative, of course; we all see things differently. But be that as it may, we still have the right to make what we think are priorities, the actual priorities of the nation. To do that, however, will require a quite different way of going about doing work in the first place; as well as distributing the productive capability of this nation; certainly if you value doing so fairly, within the will of each City State majority. What that will end up being will also be the result of negotiation, and the will of the majority, in each City State. We must first stop, however, and see that Capitalism is obsolete. Accept it. And be resigned in the only path that must then lay before us: to redefine out constitution. To redefine what work, and our participation in that work, is and what it then requires in both our responsibility to it, as well as it's responsibility to us. We can do this. But only if we can see the common purpose, as well as the better individual gain. We just need to first recognize that Capitalism can't take us where we need to go. From that point on it will be limited only by our imaginations; our ability to cooperate, and our ability to see that we must keep talking; always, and keep trying to compromise for the ever shifting balance between the one, and the many. 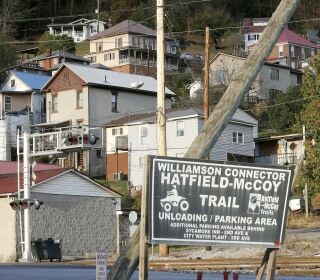 Why did a W.Va. town of 3,200 need 20.8 million pain pills?